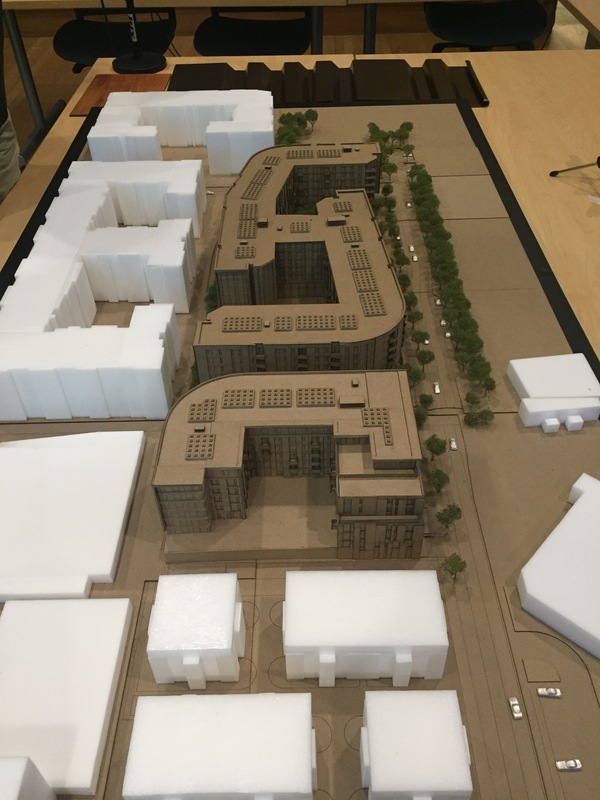 The model showed the true bulk of the building, dwarfing the large developments next door. Looking towards the RR tracks, CVS to the right, Concord Ave behind you. FPRA submitted this letter to the Planning Board at their Hearing on September 5th, 2017. The model drew gasps from those present, as it showed the true bulk and shadows posed by the building that were not apparent in the artist’s renderings. The hearing was continued–there were numerous questions and concerns especially regarding flood risk, traffic impacts, mobility/access, preponderance of studio/1-BR units (72%), soil contamination, building materials and quality of construction, sheer size, etc. FPRA emphasized that this project was at odds with the plans currently being developed through the Envision master planning process and should be re-evaluated by the City in terms of the Envision goals and plans. See video of Hearing and Special Permit Application materials (scroll to bottom). It is essential that residents continue to express their concerns at subsequent Hearings. Let us know what you think, especially if you live or work nearby. On behalf of the board and membership of the Fresh Pond Residents Alliance (FPRA), we politely submit the following comments regarding tonight’s Planning Board case #SP330, a proposal to construct 526 new residential units on a site located at 55 Wheeler Street in West Cambridge. To begin, let us say that we appreciate that the project has evolved from its original design in several positive ways. A significant number of the questions that we and others raised have been answered. That said, there are still aspects of the project which concern us. 1. Respect for Neighbors. We are extremely supportive of the need to protect neighboring residents from harmful project impacts, both during and after construction. As such, we strongly support the Reservoir Loft owners’ previously documented requests for construction mitigation measures (including dust, noise, and construction vehicles entering and exiting), traffic mitigation measures (including service road noise control measures), careful building siting and design, storm water management best practices, and support for increased housing ownership. Also included in this category would be fire safety, as recent events have shown that such large, stick-built buildings are extremely susceptible to fire, both prior to final sprinkler activation and, after activation, from ignition sources in attic and exterior areas where sprinkler units are not typically installed, and, once on fire, can endanger surrounding structures. 2. Traffic. We are supportive of proposed improvements to the existing road layout in order to connect a dead-end street and improve traffic flow on surrounding streets. We are particularly concerned that left-hand turns onto Concord Ave. from Wheeler St. will be even more disruptive to the flow of traffic than at present and will back up traffic into the rotary. To eliminate such an outcome, we REQUIRE that Wheeler St. be redirected as a one-way street moving from Concord Avenue in towards the site, with traffic in turn exiting the area via Fawcett Street and Terminal Road. We understand that if the connector road is to handle traffic from Wheeler, there needs to be a safe place for the moving vans of Atmark residents to park without obstruction. In addition, because the project degrades Wheeler Street to an “F” level of service, then overflows to Fawcett Street and degrades Fawcett to “F,” as well, the Fawcett Street-Concord Avenue intersection will require changes. The traffic study’ Signal Warrant Analysis expects that a traffic signal will be needed to allow cars to exit Fawcett Street in a timely manner. We STRONGLY SUPPORT such a signal. We also believe that a similar signal will be necessary at Smith Place for at least part of each day to account for overflow traffic from Fawcett Street, as the increased morning delays at all unsignalized Concord Avenue intersections are disastrous (91.1 seconds of average additional delay per intersection). Finally, we believe that a connection to Terminal Road is CRITICAL to improving the current conditions at the site. Such a connection will allow vehicles, cyclists, and pedestrians to access Route 2, Alewife Station, the Fresh Pond Mall, and New Street without needing to use Concord Avenue or the rotaries at all. It will also improve truck deliveries to the rear of CVS and Trader Joe’s. 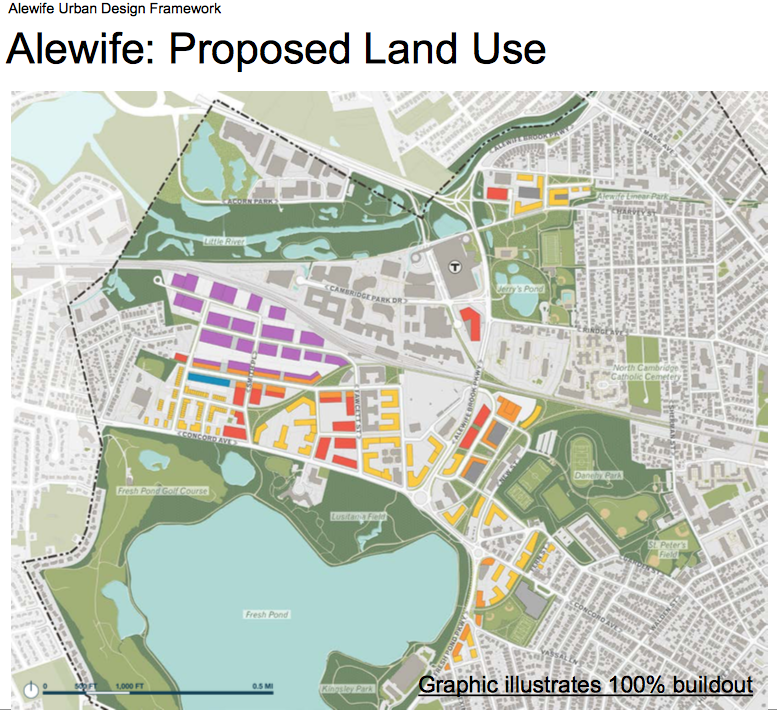 We are concerned that no mention of such a connection was included in the proponents’ most recent plans, despite such a connection being a neighborhood planning priority for almost 40 years, including in the most recent version of the Envision Alewife study. There is also the larger problem, however, of adding the residents of and visitors to more than 500 new units to an already severely over-loaded road system. Evening peak traffic is anticipated to double, and the traffic presentation we saw showed an “added delay of more than 20 seconds” at both Fawcett and Wheeler Streets, with both intersections degraded to an “F” level of service both morning and evening. The traffic study itself suggested up to 20 traffic exceedences, with wait times in excess of 120 seconds per car at some intersections. This is unacceptable. Two new permitted projects (Homeowner’s Rehab, Inc. on Concord Avenue and Lanes & Games on Route 2) were omitted from the future traffic estimates. In addition, the mode-share analysis assumes adequate capacity and accessibility to transit and other mobility options, for which there was no evidence. We have also asked repeatedly that the study be revised to incorporate the three major changes suggested above. Lastly, we also refer you to Steve Kaiser’s letter of March 21, 2017, which raises many additional and important points and suggestions. 3. Mobility/connectivity. We appreciate that the project reserves land for a future multimodal bridge over the railroad tracks. We believe that this bridge, in some form, is essential to the future mobility of the site and of the Quadrangle neighborhood of which it is a part. We hope that the developer will make a significant financial contribution to making this bridge a reality. The construction of safe, continuous street design with bike and pedestrian pathways is also essential, and the developer of this site has an important role to play in working with the City, neighboring property owners, the neighborhood, and the Alewife TMA to make this site truly work from a mobility point of view. We hope that the developer will actively advocate among other stakeholders on behalf of this important project and make explicit what their financial contributions will be. Again, we were disappointed to see no dedicated bike infrastructure included in the final design of either Wheeler Street or Fawcett Street, particularly since the final traffic study forecasts an increase in Fawcett Street traffic volumes of up to 40% by 2021. This is unacceptable. With such volumes, we do not believe that sharrows (or worse) are sufficient to ensure the safety of cyclists. Other area projects have been required to pay for separated cycle tracks in front of their projects; we would expect the same in this case. Moving curbside tree plantings to the back of the sidewalk is just one possible approach to create more space for such features. 4. Public Open Space and Building Scale. The designated open space between the electrical substation and the railroad tracks is unlikely to be much of an amenity without considerable work to buffer it from the unattractive, neighboring land uses. We understand an effort has been made to plant vegetation as a screen and we would like to see more detailed plans of how to make this area usable, attractive, and well-maintained. The tree-lined “allée” and the open spaces arranged as pocket parks and pathways hold promise (though we do have some concerns that the City will allow mature trees to remain on top of the storm water easements located in this area). It is important that the public feels welcome in these spaces and that they do not appear to be exclusively for residents of the buildings. For example, to reflect the history of Alewife and to signify the character of the place that Alewife is becoming, we support the preservation of all or most of the three contiguous courtyards of Abt Associates. This open space with mature vegetation has been a center of past innovation; innovation that, we hope, will continue in the Alewife region. A connection to Terminal Road is crucial, and will allow residents to more easily access Danehy Park and relieve some of the pressure on Fresh Pond Reservation. And though the shape and massing of the buildings is creative and provides some visual relief and views connecting through to Fawcett Street, we question, however, whether the site and its immediate surroundings can accommodate the number of units proposed and still provide adequate open space. The 526 units proposed for the site would be the largest residential development in Cambridge in at least 45 years, representing in total the equivalent of two of the three Rindge Towers. By comparison, we would note that the LEED standards for such a site only require 231 residential units to qualify for the LEED credit for increased urban density. This project proposes more than double that number. Though Cambridge continues to demonstrate an insatiable demand for new housing, we strongly question whether this particular site is the best location for such a large project. In addition, open space that is vegetated and includes large trees for shade is essential to mitigating the heat island effect that this area is prone to due to the large amount of impervious cover. The proposed open spaces should be designed to also trap and treat storm runoff so that it enters the storm water catchment system, and ultimately Alewife Brook, free of pollutants from roadways and parking areas. We would like to see a drainage plan that utilizes green infrastructure to treat the runoff from small storms. We are pleased to see that there is very little surface parking proposed on the site, but we also strongly object to the granting of a special permit to allow the project to proceed with a substandard amount of permeable area. As recent events have shown, now is not the time to be reduced permeable area, particularly in such a flood-prone area. We would ask how the City can ensure that these new open spaces remain publicly accessible in perpetuity, how they will be maintained, and how they will be programmed. Similarly, we are not at all satisfied with the long list of issues to be resolved during continuing design review. For example, what percentage of the ground floor of each building will be transparent? The developer makes no commitments, even though local design standards specify a specific requirement. How will a 7-story building not create significant shading of neighboring units at Atmark? Though we are satisfied with the overall design direction expressed in the renderings, the public nevertheless deserves to have input in any significant revisions. Lastly, we would support an even greater reduction in the proposed parking ratio for the project, perhaps as low as 0.6 spaces per unit, as other recent area projects have successfully pioneered. In fact, Redgate’s recent proposal for a development in South Boston proposes a ratio of 0.62. The reduction in required parking could be used to further reduce overall building size, or to increase underground flood storage capacity. 5. Ownership, Inclusion, and Community. We strongly support the developer’s past promises of adding a building consisting of ownership units to the plan. This would provide more of a community anchor with people who are invested in the long-term welfare of the area, provide a better transition to the ownership units at The Reservoir Lofts next door, and provide a greater variety of residential options for the area. We hope that the Board will see fit to mandate this ownership requirement, as the most recent project narrative makes no mention of such units. At the same time, meeting the 20% inclusionary requirement in both rental and ownership buildings will also enhance community stability, as well as overall diversity and opportunity. We would hope that inclusionary units would not be segregated to the building’s ground level, but instead arranged throughout the building. In addition, we hope the developer will consider an additional 5% priced at a workforce level (80- 120% of AMI) to provide for residents who are above the inclusionary criteria but otherwise not able to afford living in the area. Finally, providing 3-bedroom units is also important so that families with children can live in this housing. In any case, we would expect the Planning Board to document any specific project promises regarding ownership units, workforce units, or bedroom counts in their final decision conditions. 6. Overall Regional Context. It is not possible to assess all the incremental positive and negative impacts of each local project without considering the cumulative effects of all such local projects. In light of that, the applicant (or Cambridge’s Community Development Dept.) should provide additional details of such cumulative impacts, including current and planned developments, anticipated changes in population, expected populations of school-aged children, anticipated number of affordable housing units, percentage of open space (both permeable and publicly accessible), as well as housing turnover rates—especially of rentals. We need to see the cumulative effect of all expected projects, rather than assess each project in a vacuum. The applicant (or CDD) should also present the cumulative effect of all projects on transportation and circulation patterns, additions to the housing stock, and implications for public services including schools and libraries, and usable open spaces for the entire area, in keeping with the ongoing work of the Envision Cambridge process to which so many of us have contributed. 7. Environmental Concerns. Given the site’s past history of contamination (MassDEP case # RTN 3-27850 for both Lead and Cadmium), we would ask for additional detail around this important local topic. What contaminants are present on the site? What is the expected process for site remediation? Will excavation expose contaminated soils or ground water that will need to be remediated or that might migrate off-site? If so, how will these issues be addressed? And, lastly, how do you expect to keep residents and abutters abreast of further environmental developments? In light of recent events in Houston, it is important to ensure that contaminated soil, if flooded by storm water, doesn’t spread these contaminants to neighboring areas. Accommodate flooding: utilize rain screen construction methods, provide compensatory storage, protect property of tenants/owners (including cars), store wastewater, protect utilities, elevate backup generators and electrical rooms above ground level, limit paving, infiltrate and filter runoff from small storms to protect water quality using green infrastructure. Protect the safety and welfare of the residents: eliminate residential units on the ground floor as was done at Lanes & Games, inform prospective owners/tenants of the dangers of flooding, provide safe shelter in places, spaces, and systems, provide emergency egress via operable windows in all units. Improve downstream water quality: improve water quality by both limiting and delaying water releases from the site to the watershed. Minimize heat island impacts: Using shading and green infrastructure, significant large shade trees and other vegetation, white roofs, and other means to reduce ambient summer air temperatures during heat waves. Comply with Net Zero. How the project will comply with the city’s Net Zero Action Plan. We recognize that such steps may represent a significant investment on the part of the developer. That said, The National Institute of Building Sciences estimates that each dollar spent on flood mitigation saves $5 in future flood damage. As such, we believe that such steps to improve climate resiliency are wise investments. Thank you for considering our comments; we look forward to continued discussion. In the meantime, please don’t hesitate to contact us should you have further questions. View Alewife Working Group Meeting 11 (July 27, 2017) presentation here: http://bit.ly/2tK1xxY. Utile’s Tim Love, the leader of the City’s consultant team, presented the vision for the whole Alewife area for the first time. He emphasized that the plan so far attempts to balance the aspirational with the practical. Their goal is to look at the whole picture rather than the current one-project-at-a-time approach taken by the city. Working Group members were positive about many elements of the plan, but emphasized the need to drill down to find the ways to ensure that the plan is in fact executed. Some of what the plan contains, like a bridge over the tracks, has been proposed before but never carried out. There needs to be real investment to make it happen. Execution is key. The next meeting will be in September and by then the plan will be articulated with the Envision Climate and Environment Working Group’s results. Projected population. There has been no projection of total population that would be added to the area as a result of the schemes he was presenting. They list the number of jobs and units but not the resulting population. FPRA noted that without population numbers there is little way of evaluating the impact on public services and public infrastructure needs, like playgrounds and libraries. There is no way to justify the amount and location of retail services that will be viable or required. Housing. There was little information about the character of the housing inventory to be added. We have a sense that much of the housing that has been built is serving transients and is relatively expensive. FPRA will continue to press for more ownership (condos) in the future inventory to establish a more permanent population base that would be concerned about the amount and quality of public services for them and their families. How to ensure that developers follow the plan’s vision and the desired urban form was discussed. Retail. The entirely redeveloped shopping center was revised slightly to improve car access/egress from Fresh Pond Parkway and incorporate open space and non-vehicular connections. Terminal Road and a bike path along the RR right-of-way to improve connections with the Quad are significant improvements. It is still an above grade parking garage-oriented project, although the garages are mostly hidden from sight. If there is a notion that the owner would receive substantial zoning incentives the city ought to get them to pay for an underpass for at least pedestrians and bicycles from Rindge towers to the shopping center. Further, they should be prepared to dedicate a public right of way for the Terminal Road-to-New Street connection. The new plan includes a significant amount of housing over the retail and is modeled to some degree on Assembly Square in Somerville. Transportation/Mobility. Pedestrian/bike mobility linkages were improved, including a continuous loop between the Quadrangle and the Shopping Center, Danehy Park, Tobin School and Fresh Pond. There was no improvement in linkages, either bike/ped or vehicle, across the RR tracks, which remains the “Great Wall” blocking transit-oriented development and exacerbating traffic problems. FPRA suggested that a “passage” be shown on the plan to represent commitment to a solution (whether a tunnel or bridge, vehicle or non-vehicle, commuter rail station or whatever) to be determined by a transparent, multi-stakeholder process and in-depth study of options with calculation of cost for each option. We need to have a push for the whole hierarchy of needs–Commuter rail station, better bus service from MBTA and a local system perhaps as part of the TMA to serve not only the Quad, Triangle and shopping center but also the surrounding residential areas, especially Rindge Ave.
Open Space. Open space in the quadrangle is still way below par for the population they propose to put there, which will increase pressure on Rafferty Park and Fresh Pond Reservation. FPRA commented, and the consultant agreed, that the next presentation should show the stormwater treatment and green space in the quad that is achieved by realignment of buildings and setbacks as promised. It was also pointed out that the high density of the industrial buildings makes it hard to gain the necessary green space, much is devoted to truck parking and access. They plan to show significant tree cover to reduce the extreme heat island that currently exists. A new element was a restored Jerry’s Pond and extensive park. This is a very positive vision for an open space asset for the large population across the street in Rindge Towers and linking the T station to North Cambridge. But they haven’t addressed how to clean up the WR Grace site of all the asbestos in the soil next to the Russell Field youth sports area. Light industrial/maker space. FPRA pointed out that they still haven’t addressed why they needed to increase the density in the Quad from their original mixed industrial scenario, which matched currently zoned density. The current zoning was supposed to cover 20-year projections from the 2006 Concord-Alewife Study. Making the vision of a mixed-use light industrial zone within the Quad a reality given current land ownership, and bringing in public amenities like a year-round farmer’s market, will take a lot of work. Financing. Working Group members asked if Tax Increment Financing (TIF–a public financing method that is used as a subsidy for redevelopment, infrastructure, and other community-improvement projects) could be used to get the developments to pay for the public infrastructure. Utile noted that this can be done according to a formula to ensure the distribution of funds and benefits is equitable and meets city objectives overall. The plan should also show the City’s financial contribution to solving the transportation problems, perhaps including a contribution to the Alewife TMA as is done in East Cambridge. These comments are based on the presentation by the developer to the FPRA on May 24, 2017. The Fresh Pond Residents Alliance (FPRA) provides these comments on your proposed 55 Wheeler Street project as presented to us on May 24th , 2017. Thank you for your presentation to our neighborhood association and for diligently answering the questions raised during the presentation. To begin, let us say that we appreciate that the project has evolved from its original design in several positive ways. A significant number of the questions that we and others raised in the Public Presentation of March 1, reiterated in our 3/5/17 email to Anthony Galluccio and Lisa Seraphim, have been answered. That said, there are still aspects which concern us. Overall, the project is being designed for a parcel with limited site access, in an area already highly congested with traffic and with limited existing mobility options. It is also partially within the current FEMA 100-year floodplain delineation and largely within the severely flood-prone areas identified by the City of Cambridge’s Climate Change Vulnerability Assessment (CCVA). Traffic. We are supportive of proposed improvements to the existing road layout in order to connect a dead-end street and improve traffic flow on surrounding streets. We are particularly concerned that left-hand turns onto Concord Ave. from Wheeler St. will be even more disruptive to the flow of traffic than at present and will back up traffic into the rotary. To eliminate such an outcome, we suggest that Wheeler St. be redirected as a one-way street moving from Concord Avenue in towards the site, with traffic in turn exiting the area via Fawcett Street and Terminal Road. We understand that if the connector road is to handle traffic from Wheeler, there needs to be a safe place for the moving vans of Atmark residents to park without obstruction. In addition, at the Fawcett Street-Concord Avenue intersection, the traffic study expects that a traffic signal will be needed to allow cars to exit Fawcett Street in a timely manner. We support such a signal. Finally, we believe that a connection to Terminal Road is essential to improving the current conditions at the site. Such a connection will allow vehicles, cyclists, and pedestrians to access Route 2, Alewife Station, the Fresh Pond Mall, and New Street without needing to use Concord Avenue or the rotaries at all. It will also improve truck deliveries to the rear of CVS and Trader Joe’s. There is the larger problem, however, of adding the residents of and visitors to more than 500 new units to an already severely over-loaded road system. The traffic presentation was insufficient to fully understand these impacts, although a doubling of evening peak traffic is anticipated. The presentation showed an “added delay of more than 20 seconds” at both Fawcett and Wheeler Streets, with both intersections degraded to an “F” level of service both morning and evening, but the traffic study itself suggested wait times in excess of 120 seconds per car at these intersections. This is unacceptable. In addition, the mode-share analysis assumes adequate capacity and accessibility to transit and other mobility options, for which there was no evidence. We look forward to reviewing the traffic analysis in greater detail, and would ask that the study be revised to incorporate the three changes suggested above. As we asked in our 3/5/17 email to Anthony Galluccio and Lisa Seraphim, based on the Public Presentation of March 1, we hope that the TIS will include analysis of impacts of and to Blanchard Road as well as off-peak impacts. We also refer you to Steve Kaiser’s letter of March 21, 2017, which raises many additional and important points and suggestions. Mobility. We appreciate that the project reserves land for a future multimodal bridge over the railroad tracks. We believe that this bridge, in some form, is essential to the future mobility of the site and of the Quadrangle neighborhood of which it is a part. We hope that the developer will make a significant financial contribution to making this bridge a reality. The construction of safe, continuous street design with bike and pedestrian pathways is also essential, and the developer of this site has an important role to play in working with the City, neighboring property owners, the neighborhood, and the Alewife TMA to make this site truly work from a mobility point of view. We hope that the developer will actively advocate among other stakeholders on behalf of this important project and make explicit what their financial contributions will be. Public Open Space and Building Scale. The designated open space between the electrical substation and railroad lines is unlikely to be much of an amenity without considerable work to buffer it from the unattractive, neighboring land uses. We understand an effort has been made to plant vegetation as a screen and we would like to see more detailed plans of how to make this area usable, attractive, and well-maintained. The tree-lined “allée” and the open spaces arranged as pocket parks and pathways hold promise (though we do have some concerns that the City will allow mature trees to remain on top of the storm water easements located in this area). It is important that the public feels welcome in these spaces and that they do not appear to be exclusively for residents of the buildings. For example, to reflect the history of Alewife and to signify the character of the place that Alewife is becoming, we support the preservation of all or most of the three contiguous courtyards of Abt Associates. This open space with mature vegetation has been a center of business development and innovation that took place and will continue, we hope, at Alewife. A connection to Terminal Road is crucial, and will allow residents to more easily access Danehy Park and relieve some of the pressure on Fresh Pond Reservation. The shape and massing of the buildings is creative and provides some visual relief and views connecting through to Fawcett Street. We question, however, whether the site can accommodate the number of units proposed and still provide adequate open space. Open space that is vegetated and includes large trees for shade is essential to mitigating the heat island effect that this area is prone to due to the large amount of impervious cover. The open space should be designed to also trap and treat storm runoff so that it enters the storm water catchment system, and ultimately Alewife Brook, free of pollutants from roadways and parking areas. We would like to see a drainage plan that utilizes green infrastructure to treat the runoff from small storms. We are pleased to see that there is very little surface parking proposed on the site. Ownership, Inclusion, and Community. We strongly support the developer’s addition of a building consisting of ownership units to the plan. This will provide more of a community anchor with people who are invested in the long-term welfare of the area, provide a better transition to the ownership units at The Reservoir Lofts next door, and provide a greater variety of residential options for the area. Meeting the 20% inclusionary requirement in both rental and ownership buildings will also enhance community stability, as well as overall diversity and opportunity. In addition, we hope the developer will consider an additional 5% priced at a workforce level (80- 120% of AMI) to provide for residents who are above the inclusionary criteria but otherwise not able to afford living in the area. Finally, providing 3-bedroom units is also important so that families with children can live in this housing. In any case, we would expect the Planning Board to document any specific project promises regarding ownership units, workforce units, or bedroom counts in their final decision conditions. Overall Regional Context. It is not possible to assess all the incremental positive and negative impacts of each local project without considering the cumulative effects of all such local projects. In light of that, the applicant (or Cambridge’s Community Development Dept.) should provide additional details of such cumulative impacts, including current and planned developments, anticipated changes in population, expected populations of school-aged children, anticipated number of affordable housing units, percentage of open space (both permeable and publicly accessible), as well as housing turnover rates—especially of rentals. We need to see the cumulative effect of all expected projects, rather than assess each project in a vacuum. The applicant (or CDD) should also present the cumulative effect of all projects on transportation and circulation patterns, additions to the housing stock, implications for public services including schools and libraries, and usable open spaces for the entire area. Environmental Concerns. Given the site’s past history of contamination, what is the expected process for site remediation? What contaminants are present on the site? Will excavation expose contaminated soils or ground water that will need to be remediated or that might migrate off-site? If so, how will these issues be addressed? And, lastly, how do you expect to keep residents and abutters abreast of further developments? Accommodate flooding (see figures, below): provide compensatory storage, protect property of tenants/owners (including cars), store wastewater, protect utilities, infiltrate and filter runoff from small storms to protect water quality using green infrastructure. Protect the safety and welfare of the residents: inform prospective owners/tenants of the dangers of flooding, provide safe shelter in place spaces and systems, provide emergency egress. Thank you for considering our comments; we look forward to continued discussion. We hope that you will be able to develop a project website that contains current project information for easy public access. In the meantime, please don’t hesitate to contact us should you have further questions. The Fresh Pond Residents Alliance, the neighborhood group that includes the Alewife planning area, supports the need for comprehensive planning of the Alewife area. We are concerned, however, that the scenarios and plans being developed through the Envision planning process do not represent the best interests or concerns of the Alewife area residents, nor of the city as a whole. We raised many of these concerns in our letter of 2/1/17 (attached), to which we have received no response. Our members have strongly expressed their concerns several times at both FPRA public meetings and Envision public meetings. Although every Alewife Envision Working Group and public meeting begins with a review of the vision statement, the plans presented clearly do not meet this vision. We support the goal that Alewife provide significantly more housing and economic opportunity than at present within various real constraints, including the area being subject to severe flooding as soon as 2045, the date at which the 100-year storm is predicted to outflank the Amelia Earhart dam. Our first concern is that the proposed scenario and accompanying zoning changes will degrade the sustainability, social interactions and safe connections of the area. While we have repeatedly asked to see scenarios that have a lower density than the current zoning allows—which is itself a major increase in density over the 2004 status quo—we continue to be presented with plans that have significant increases in density. At the public meeting held by Envision on 2/8/17, the audience clearly supported seeing a lower density scenario. At the FPRA public meeting of May 24, the participants reiterated this position. The “middle-of-the road” proposal presented at the Envision Alewife Working Group meeting of 4/27/17 still showed an increase in density—from 1.3 FAR to 1.56 FAR. The impacts—which is what matters in the end— were presented only for the 60% build-out, and were particularly worrisome in the case of traffic on Concord Ave. These impacts were obviously an underestimate of the final impacts at 100% build-out. It may be argued that 100% build-out is a long time off. However, what we have seen at Alewife is, to the contrary, that construction has far outpaced the expected rate of development laid out in the 2005 planning scenarios. According to the presentation of impacts, existing quadrangle peak traffic on “Outer Concord Avenue” is already about 800 cars on top of the 500 cars that are from non-quadrangle traffic (slide 45). That can hardly be blamed on through-traffic to Boston. The proposed “New combined scenario” adds another 500 or so cars on top of the current existing 1,300 (approx.). But that is at only 60% of the build-out, so it underestimates the impact not only on that section of road, but on the Blanchard intersection and residents in Cambridge/Belmont at one end, and the entire Fresh Pond Parkway rotary system at the other end. In addition, several projects under active discussion with the City and residents have been omitted: 55 Wheeler Street, despite the developer having been engaged in active discussions with CDD since at least August of last year, is not included. This project is proposed as 530 units. The map also fails to include 605 Concord Ave. (49 units already permitted) and Fawcett Street (44 units currently under construction). Why does this matter? 55 Wheeler St. includes one of the proposed green spaces shown on page 22, as well as the frequently discussed bridge landing. 55 Wheeler Street also includes three new streets shown on page 23, one of which their current project design would render impossible. On page 37, there is a map labelled as “Housing Units- Existing and Pipeline.” None of the 3 projects mentioned are included on the map, and, therefore, the baseline figures on page 36 appear much lower: the current housing situation totals 697 units, 98 of which are still to be built. In fact, the real numbers are 1,320 units, 721 of which are still to be built. This allows them to show a rosier picture on page 36. The bar graph for the New combined (preferred) scenario shows a housing total of 1,777 units at 60% buildout. The real number will be 2,400, by our count. This will in turn affect the traffic calculations. We have, thus, a fundamental question. At what point, or by whom, was it decided that the Alewife area should increase its density above the already high increase allowed in 2005? Why is this being relentlessly pursued with no explanation, as if it were a foregone conclusion? The Envision “New combined scenario” has a painfully small amount of open space proposed for public use. But at the proposed density there is nowhere to expand the public open space to. As property values continue to relentlessly climb, the City needs to take action now to secure open space and tackle the mobility and traffic issues head-on. May we state the obvious that making more intersections F-rated is not acceptable? Our other grave concern is that the entire development of the quadrangle so far depends on one-sided access—Concord Avenue—forming a near cul-de-sac for thousands of residents and workers, while simultaneously claiming to be transit-oriented and maximizing the opportunities for sustainable transportation. The refusal of CDD and the consultant to even show the necessary bridge across the T tracks to link the area to the Alewife station is makes the area unworkable. To say that it can’t be shown because some other more important investment could prevent it from being built, may be too close to the truth. But it is important to make this area function reasonably well while we still can. We are well aware that features not shown on a plan will simply not happen. We learned that from the 2005 Alewife plan. As we asked in our February 2017 letter, there must be a commitment to invest in the infrastructure that will make this development work. Waiting until after the development has occurred is a recipe for failure—which the residents will have to live with for years to come. There are several things to like about the “New combined scenario” that was presented at the Working Group meeting. The presentation of the housing, jobs and tax/fiscal impacts were also helpful, albeit for only 60% build-out. The improved street grid, mix including light industrial, commercial, and owner-occupied townhouses that would help stabilize the neighborhood, together with creative structural approaches to inevitable flooding, hold promise. However, this will not work at the density proposed. It will not result in a livable Alewife community and will have serious negative impacts on neighboring streets and communities. At a lower density there could be reasonably-sized public open green spaces, stormwater treatment, and transportation linkages that could double as emergency access and egress during flooding without sacrificing a major increase in residential and economic development. We respectfully ask the City Council and Community Development Department to require a lower density scenario with the necessary infrastructural investments be developed and presented to the public. We also ask that a serious multi-stakeholder Alewife Mobility Task Force be established by the City, similar to what exists in Kendall Square, including the Alewife TMA, community groups and others. This Task Force should report back to the City Council with proposed actions and within a defined timeframe. We look forward to your response and continued dialogue regarding development in Alewife. Alice Heller, Corporal Burns Rd. Peggy Barnes Lenart, Fayerweather St.
Arthur Strang, Fresh Pond Pkwy. Get the latest information and vote on important issues. A strong Neighborhood voice makes a difference! Projection of Alewife Flooding at Lanes & Games from Cambridge Climate Change Vulnerability Study data. While the likelihood of flooding increases in our area, development is accelerating in the floodplain. And if you think traffic can’t get worse, think again. Come evaluate the 530-unit development at 55 Wheeler St. (formerly Abt). Hear concerns about the Envision Cambridge planning process in Alewife. Make input into neighborhood positions. City Council Approves 20% Inclusionary Zoning! On April 3 the Cambridge City Council unanimously voted to increase the inclusionary housing requirement to 20%! This is the first increase in 19 years, and will significantly increase the new affordable housing available in Cambridge. Congratulations to Cambridge Residents Alliance which has been pushing for an increase for years. Thanks also to Black Lives Matter Cambridge who stood up visibly and vocally for this change. We all wish this had been done years ago, so that we could have prevented the displacement of many Cambridge residents. This change, however, should be celebrated and we thank the City Council for making it a reality. No further increases in density. City Councilors passed the ordinance with these change because they listened to all of you who spoke during public comment, made calls and sent emails. Thank you! We also aim to press for 20% for low-moderate income people and 5% for middle income people, as CResA called for, at the time of the annual review. FPRA will work with CResA for even more affordable housing measures.